The Honeymoon Effect: A state of bliss, passion, energy and health resulting from a huge love. Your life is so beautiful that you can't wait to get up to start a new day and you thank the Universe that you are alive In his new book, bestselling author of The Biology of Belief, Bruce H. Lipton, PhD, asks readers to think back on the most spectacular love affair of their lives. It was a time when they were exuberantly healthy, when they were overflowing with energy, when they were loving their lives so much they couldn't wait to bound out of bed in the morning to experience more. It was the 'Honeymoon Effect' that was to last forever. Lipton explains that this 'Honeymoon Effect' was not a chance event but a personal creation. Just as important, he explains why honeymoons are so often short lived. 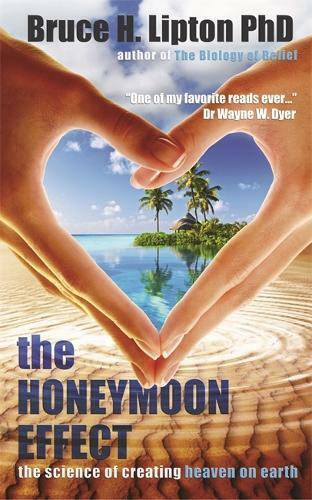 This book describes how readers manifested the Honeymoon Effect and the reasons they lost it in their lives. That knowledge empowers them to create the honeymoon again, this time in a way that ensures a happily-ever-after relationship that even a Hollywood producer would love. With authority, eloquence and an easy-to-read style, Lipton covers the influence of quantum physics (good vibrations), biochemistry (love potions), and psychology (the conscious and subconscious minds) in creating and sustaining juicy loving relationships. He also asserts that if we use the 50 trillion cells that live harmoniously in every human body as a model, we can create not just honeymoon relationships for two, but also a 'super organism' called humanity that can heal our planet.